The Nation's critic fails to catch Beatlemania. 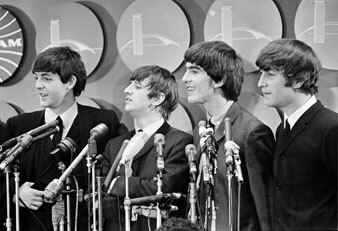 The Beatles meet reporters at Kennedy Airport in New York City, Feb. 7, 1964. The Nation‘s critic fails to catch Beatlemania. Popular music in America is better than ever. For the first time in the history of the Top-Forty-Juke-Box-Best-Sellers there is some correspondence between the singer and the song. The best of today’s vocalists—Diane Warwick, Martha and the Vandellas, Dusty Springfield, Patty Labelle and the Blue Belles—are young people singing from their own experience in a song that is a part of their particular heritage. They learned this music at home, at church and in the neighborhood— and after the recording session is over, it’s only natural that they should keep on singing in the same way about the same things. In this sense, they are the real folk singers of our time, far more “authentic” than the city-billy’s academically perfect imitation of a sound created from an experience different from his own. As much as he sounds like Leadbelly or Big Bill Broonzy, Johnny Hammond did not grow up a black man in the South; nor did the New Lost City Ramblers learn their old-timey mountain music as poor Kentucky farmers. Their musical tradition goes back no farther than some very careful listening to old Library of Congress tapes and Folkways recordings. Another group which must have spent a great deal of time lately paying close attention to old records and making faces in the mirror are the Beatles, four young men from the mainstream of working-class Liverpool, with skin-tight, blue gray suits (velvet lapels), mops of long brown hair, and an electrical system guaranteed to numb the senses of even the most reluctant attendant. Their recent invasion of the United States was the PR man’s finest hour (reportedly, thirteen publicity firms worked on the debut). For weeks the national press, radio and TV, and the slick magazines had instructed novitiates on what to expect and how to react. Beatle records blasted the air waves, promoted by disk jockeys eager to claim a “first discovery” (actually Beatle records were in this country ten months ago, but no one played them until the press agents got to work). Wigs, buttons, locks of hair, wallpaper, the hour of their arrival in New York, the exact location of their daily activities, all contributed to a triumphant exploitation of the affluent teen-ager. By the time the Beatles actually appeared on the stage at Carnegie Hall, there wasn’t a person in the house who didn’t know exactly what to do: flip, wig-out, flake, swan, fall, get zonked—or at least try. Musically, the Beatles are an anachronism. They come pure and unadulterated from the early 1950s, the simple, halcyon days of rock ‘n roll: Bill Haley and his Comets, Little Richard, Elvis Presley, the Eberle [sic] Brothers, the Ted Steele Bandstand. The Beatle sound is primitive rock ‘n roll—straight four-four rhythm, undistinguishable melody, basic three-chord guitar progressions electrically amplified to a plaster-crumbling, glass-shattering pitch. It’s loud, fast and furious, totally uninfluenced by some of the more sophisticated elements in American music that have brightened our pop scene in recent years. One can only assume that Ray Charles, gospel, rhythm and blues, country and western, and other purer folk sound has yet to cross the Atlantic. The English always have been a bit behind us—witness Oliver, a good old-fashioned American musical comedy, or Saturday Night and Sunday Morning and other realistic films in the 1930s’ style. Often they do improve upon our models; the Beatles, with their American accents, their savagely delivered musical cliches, their tight pants, hair cuts and wild gyrations, are more entertaining and intelligent than anything we produced ten years ago. But the Beatles remain derivative, a deliberate imitation of an American genre. They are surely not singing in a musical tradition which evolved spontaneously from their own lives or from a “natural” habit of expression. This is probably why the reaction at Carnegie Hall was not a real response to a real stimulus, there weren’t too many soul people there that night either on the stage or in the audience. The full house was made up largely of upper-middle-class young ladies, stylishly dressed, carefully made up, brought into town by private cars or suburban buses for their night to howl, to let go, scream, bump, twist and clutch themselves ecstatically out there in the floodlights for everyone to see; and with the full blessings of all Authority: indulgent parents, profiteering businessmen, gleeful national media, even the police. Later they can all go home and grow up like their mommies, but this was their chance to attempt a very safe and very private kind of rapture. Most did what was expected of them and went home disappointed. Disappointed because nothing really passed from the stage to the audience that night, nor from one member of the audience to another. There was mayhem and clapping of hands, but no sense of a shared experience, none of the exultation felt at a spontaneous gathering of good folk musicians, or, more important, at a civil rights rally where freedom songs are sung. The spectacle of all those anguished young girls at Carnegie Hall, trying to follow “I Want To Hold Your Hand,” seems awfully vapid compared to the young men and women who sing “I Woke Up This Mornin’ With My Mind” (. . . Stayed on Freedom). The Beatles themselves are lively and not without charm. Perhaps their greatest virtue is their sense of humor and self-caricature. But Beatlemania as a phenomenon is manna for dull minds.